An emergency fund is a cash reserve you set aside to be used for unexpected expenses, or for regular expenses in the event of loss of income. If our lives went exactly as planned, we would never experience things like major home repairs, medical problems, or job loss. Unfortunately, all of these things are a reality and they often come at high costs. That is why it’s so important to have an emergency fund. Before we discuss where you should keep your just-in-case nest egg, let’s talk about how my own emergency fund has come in handy. Having an emergency fund has come in handy for me multiple times. The first was right after college graduation. I landed a job in the Washington, D.C. Metro area before graduating and was set to start mid-August. I found an apartment nearby, signed my lease, and had everything squared away. Then, two weeks before I was supposed to start the job, I received a call from my soon-to-be manager telling me that the position had been eliminated. Left with no other job prospects, I decided to move to my new apartment anyway and make things work. My emergency fund kept me afloat for two and a half months until I found a viable job. My emergency fund is also coming in handy now as I transition careers. In short, an emergency fund is a valuable tool that can keep you going in some otherwise tough situations. Given the purpose of an emergency fund, I believe it should be a liquid asset. In other words, you should be able to get your hands on the money quickly when you need it. For this reason, I’m a proponent of keeping your emergency fund in a savings account — whether that be a traditional or a high-yield one. A traditional savings account linked to your checking account is the safest way to manage your emergency fund. You’ll receive a higher interest rate on the money than if you were to keep it in a regular checking account. Plus, you’ll still have ongoing access to the money by easily transferring it between accounts. High-yield savings accounts offered by online-only banks come with an even higher interest rate on your balance. 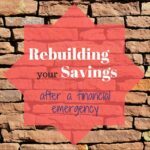 This makes it a good option for hosting your emergency fund, especially if you have a large balance. Transferring money to your main bank may take a little longer — two to three business days. So, you’ll need to take that into consideration as well. My emergency fund allocation is mix of both accounts. I have six months of expenses saved in total. The funds are split between a traditional savings account (linked to my checking account) and an online-only, high-yield savings account. Specifically, one and a half months’ worth of expenses is in my traditional savings account. The rest is in the high-yield savings account. I allocated my emergency fund this way for peace of mind and to take advantage of interest rates. I knew I wanted some money readily available to me the same day; that’s why I have some in the traditional savings account. I also knew I wanted the majority of my emergency fund to be earning a considerable amount of interest while I’m not using it. That’s why I have the rest in the high-yield savings account. In general, you want to stay away from keeping your emergency fund in taxable investment accounts. This is because you can experience a loss in the value of your money and be subject to short-term gain taxes. You also want to avoid using your credit card as an emergency fund. If you don’t have the money to pay the balance in full by the due date, you’ll have to pay interest on that amount. Of course, there are exceptions to the rules. 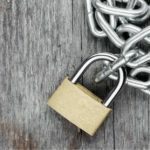 If you live in a dual-income household and have enough money in other cash accounts, you may be able to use your credit card to bail you out of a tough financial situation. This is only if you know you’ll have the money coming in to pay the bill when it comes. If you’re single or the sole provider in a family, relying on your credit card becomes a lot more risky. Experts say you should have three to six months of expenses saved in an emergency fund. That should be enough to cover you in the event of a job loss, medical problem, or series of unexpected bills. Of course, everyone’s financial situation is different. Some may need more and some may need less. You can use HelloWallet’s Emergency Fund Calculator to help you determine how much you should have saved in your emergency fund. In addition to being a safety net, an emergency fund also provides peace of mind. For that reason, it’s important to keep it somewhere that gives you that sense of security. For me, having some of it in a traditional savings account and the rest in a high-yield savings account works out to be the best allocation. Take some time to consider your financial situation and determine what’s best for you. What has been your best option for tucking away an emergency fund? Do you save a full three to six months? Less? More? It’s a tricky balance, indeed! So important to start and maintain an emergency fund. Prevents you from using credit cards to pay for unpredictable circumstances like car problems, emergency trips back home, or like in your case your job was eliminated before even starting! But too much money in an emergency fund takes away from investing in higher yielding assets. Good article. I think it is important to have good liquidity for emergencies. But I don’t keep an emergency fund per se. I do try to maintain a liquidity ratio of >1 year at all times however!